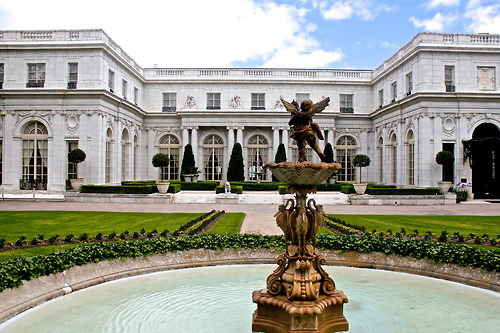 The Gilded Age in Newport, Rhode Island, where Yachting and Mansions went hand in hand. Once a bustling coastal trading town in the 17th and 18th centuries was blockaded by the British during the American Revolutionary War in 1776 for three years, and life in colonial Newport came to a halt. During the blockade, the local population of merchants and tradesmen fled from Newport to other cities to continue their business. The Pre-Revolutionary War population of 9000 people in Newport dropped to below 4000, and before the end of the 18th century over 200 abandoned buildings in Newport had been demolished. Newport slumbered into the 19th century, frozen in Pre-Revolutionary War colonial splendor of a time gone by. The constant cooling thermal winds that blow almost every summer afternoon, making Newport a sailor’s paradise, were also the financial savings of Newport. These cooling thermal winds right off of the ocean, keep the land temperatures in Newport from soaring in the summer heat. 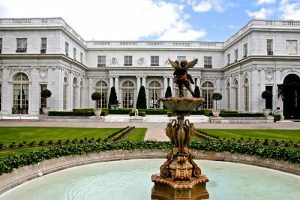 In the days before air conditioning, the wealthy began to make their way to Newport to “summer” and keep cool by the fresh ocean breezes that constantly blew across the island. And hence The Gilded Age began, a time when Newport was filled with the extreme wealthy and their yachts. The first group of summer residents to arrive in Newport were the southern planters with George Noble Jones building “Kingscote” in 1839. Soon other wealthy from Pittsburgh, Boston, New York and even Providence flocked to Newport, as even in close by Providence, the summer temperatures in Newport could be ten degrees cooler on any given day, cooled by the ocean breezes. While early colonial development of Newport clustered around the harbor for trade, the lowest land to sea level, these newcomers to Newport sought the highest land for the best of the cooling refreshing breezes. Kingscote as one of the first of these summer “cottages”, was not built down by the harbor, but along the top of the ridge of the highest point of land in this area of the island. Soon Bellevue Avenue was laid out running two and one half miles along the top of this ridge, with plots available on either side. Along this two and one half miles of road, large mansions, referred to as summer “cottages” began to spring up on either side, some with Bellevue Avenue in the front and the Atlantic Ocean in the back. Building slowed during the Civil War, but came back with a flourish after the war, and Newport’s Gilded Age was born, with such wealthy families as the Vanderbilt’s, Astor’s and the Morgan’s making Newport their location of choice for the summer. And with the wealthy that flocked to Newport for the cooling summer breezes, came their magnificent yachts, as the thermal winds of Newport were discovered to be excellent for the sport of sailing. And the deep waters of the harbor allowed these enormous sailing yachts, with their deep keels to be tied right up to the town docks, just down the hill from the the various mansions. The Gilded Age lasted from around the 1880’s until the stock market crash in 1929 and the Depression in the 30’s. 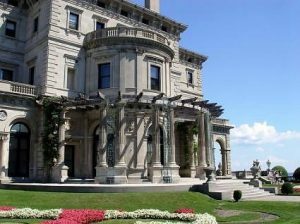 This financial debacle, and the advent of Income Tax reduced many fortunes, and the Gilded Age in Newport came to an end. However the sport of sailing continued and Newport became known as the sailing center of the United States. 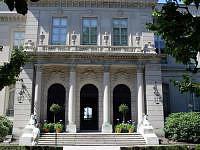 Today, Bellevue Avenue runs two and one half miles along the ridge of the island in the highest location, with the original gas fired street lights, and a display of Gilded Age Mansions on either side. Many of these summer “cottages” are open to the public, for tours and a glimpse of what life was like during Newport’s Gilded Age. 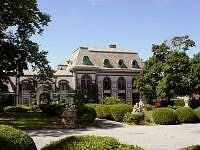 Sail into Newport on your own yacht when on charter, tie up at the same town docks, and walk up the hill from the harbor enjoying the cooler air of Bellevue Avenue as cooled by ocean thermal breezes, take a peak and have a tour of a mansion for a glimpse of that which was once The Gilded Age of Newport.